November 8, 2009 by Carol B.
I know that I still need to post Fall Retreat Pt.2, but with Bill home recovering from foot surgery, my routine has been disrupted. I will get it posted soon. I have been knitting. Kerry asked if I would make something for the new baby of a friend. So I have knit a sweater, (pics and details soon) also knit a hat, but it would fit a 3-year-old. So I have gone down two needles sizes and cast on again last night. Guess the baby will receive two hats, one for now and one for later. Hope to finish soon so I can get back to the Sivilla shawl, of which I have made it through the pattern, and started on the second repeat. 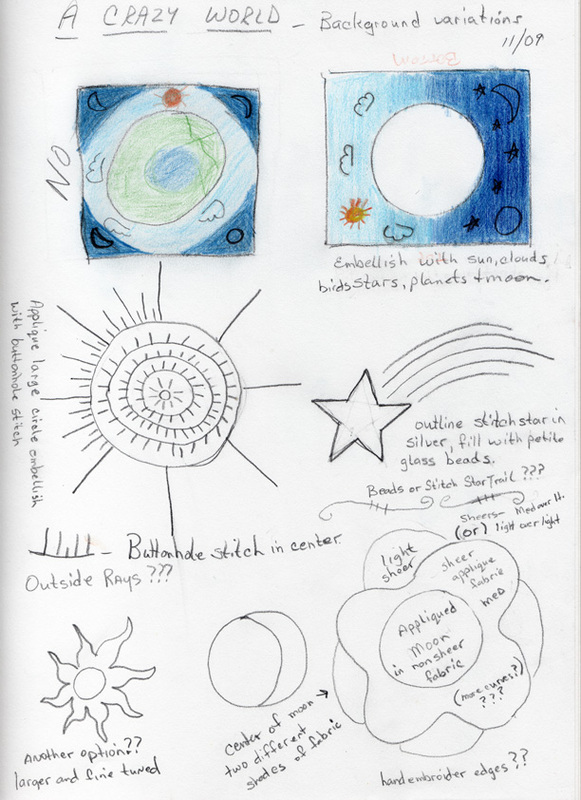 While I try to round-up more shades of blue for the background of A Crazy World, I have been doodling in my sketchbook. I am going to go with the background sketch on the right and I know that I want to applique the pieces with some curves, but can’t decide whether to work left to right, out from center, or some yet unthought of method. Your Crazy World ideas look very interesting. I’ll be interested to see your baby sweater as I’m always on the lookout for a new pattern. Don’t feel too bad the last hat I made for Sophia was way too big…… One of these days I AM going to do that shawl…….